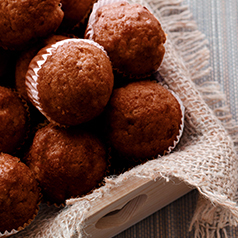 These muffins are a fantastic blend of some different, but delicious ingredients and are perfect for a mid-afternoon pick-me-up or a post-dinner sweet treat! They also keep in the freezer well, so a couple batches can go a long way. Preheat oven to 350 degrees. Line muffin pan with muffin tins or cooking spray (I like silicone muffin tins). Heat coconut oil over stovetop on medium high for 3–4 minutes or microwave on high for 1 minute. Add the cocoa and mix well. Mix all ingredients from yogurt through syrup/honey in one bowl. Mix the remaining dry ingredients together in another bowl. Add the chocolate to wet ingredients. Mix until combined. Gently whisk in dry ingredients. Cook for 25 minutes or until firm. For a more intense chocolate flavor, try using dark cocoa.